Purify Body Cleanse 180g powder in beautiful miron glass preserving caddie to preserve and protect the formula. 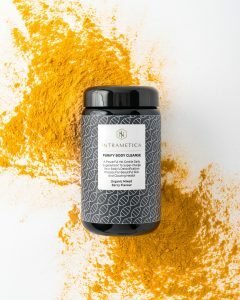 Intrametica® Purify Body Cleanse is a superfood supplement for everyday use, containing clinically proven bioactive botanicals that, support liver and gut detoxification, gut healing, gentle elimination via the bowel, and blood purification to support clear glowing skin from within. Detoxification is a natural process that your body does every day, however the human body evolved to cope with a basic diet and a clean chemical free environment. Therefore we need extra assistance to cleanse our system of the toxins built up through urban living. The liver and the colon do most of the detoxification and elimination work but when they are overloaded, toxins can transfer into fat cells, mess with your hormones and steal your energy. The bottom line is if you don’t detoxify effectively, you’ll have trouble losing weight, your skin will be duller and you’ll lose your mojo. Intrametica®’s Purify Body Cleanse to the rescue. We have designed Purify using scientifically formulated ingredients to support, stimulate and enhance your system – in just a delicious dose of water daily. Store below 25°C. Consume within 60 days of opening. Take two rounded teaspoons (5 grams) a day with 200mL of water, juice or sprinkle over food or add to your favourite smoothie blend.